John Currence is chef/owner of City Grocery Restaurant Group, including City Grocery, Bouré, Big Bad Breakfast (Oxford MS, Birmingham AL and Inlet Beach FL), Snackbar, & Main Event Catering. Born and raised in New Orleans, John’s career in food has covered half the globe, but is tightly focused on his roots in the Deep South and Louisiana. 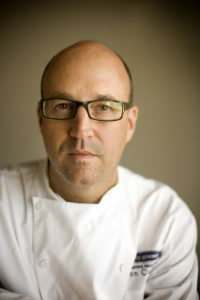 John was the James Beard Best Chef South in 2009 and a recent participant on Top Chef Masters. He is a contributing editor at Garden & Gun Magazine, and author of Pickles, Pigs & Whiskey: Recipes From My Three Favorite Food Groups and Big Bad Breakfast: The Most Important Book Of The Day. John is the founder of Move On Up Mississippi a non-profit foundation focusing on celebrating individuals that are doing significant work to help address the issue of childhood obesity.